A rise in distance was always going to suit Al Maher mare Zazparella at Sandown on Easter Monday and the game five-year-old gave all she had to share the prize in the 2100m event for mares. Travelling well for Dylan Dunn, giving the apprentice a good feel throughout, Zazparella was really charging over the final stages as Belvedere Road poked up along the rails. The pair went to the line locked and we were happy to share the prize, a dead-heat always better than a second! Recording the fifth success of her consistent 33 start career, Zazparella showed the heart that she is well known for. "That's her," said the stable's Anthony Feroce, "she is a fighter, she always tries." Noting that Zazparella is a mare who holds her form once she strikes it, Feroce is confident that there is more to come from the bay. "She came back the strongest she has been this time in and she has a good preparation ahead." 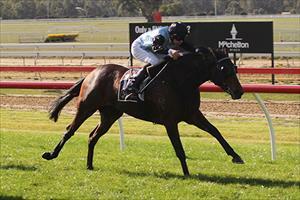 A trip to Queensland is on the cards for Zazparella, a mare we are hoping to earn black type with. "They usually get a few wet tracks during their winter carnival and that will suit her," Feroce said. Dunn was pleased with the heart Zazparella showed over the final stages of the races. "All credit to the horse, she did a really good job and she should progress from here."